I'm on a budget, so I have to get really creative with my blythe. I only say it's pretty tough because it took sooooo long to finish. I will be posting pictures, I just haven't had the time to get more yarn. Cut the toe end off an old sock (choose a sock that will blend well with the yarn color) and make sure it fits the dolls head a bit loosely. I used red heart worsted weight yarn because it's the easiest for doing the last step. Fold a strand in half and stitch the folded end of the yarn through the edge of the cut sock with a yarn needle. You should end up with a loop on the inside of the sock and two strands of yarn on the outside. For the first stitch, tie a knot to secure it in place, but make sure you leave a small loop for the next step. Stitch the next loop through the first loop. Continue stitching this way around the entire edge of the sock. Tighten loops as you go to secure all yarn in place. Keep your stitches pretty close together, but a small gap between them should be covered in the last step. I'm not too good at describing stitches, so if this is unclear, this video talks about the type of stitch I mean, starting at 1:19. If you're feeling up to it, you can stitch rows around the sock instead, but this WILL take a considerable amount of time. Especially if you plan to have the same curled look as mine. If you did the spiral stitching, hold the wig up the way it would be on your doll. Do a little styling and see if there are any large bald spots. Do stitch and tie loops if there are any. If you want a curly look like mine, start unraveling the yarn one at a time. I've only used worsted weight yarn for this, so I cannot tell you how other yarns will turn out. Each strand of the yarn I used unraveled to four thin strands. Once you're done with this, style your wig how you want it. Hairspray works well to hold it in place. 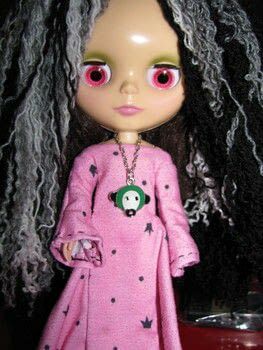 i have 3 little big eye dolls which are the most popular copies of blythe. i got one second hand that had its purple locks dramatically snipped by some little girl and everytime i bid for a new wig on ebay it goes up to some insane price and as i am a student with no job i cannot waste money on one. super duper pretty please with sugar on top make a how-to!! it will make my month! !